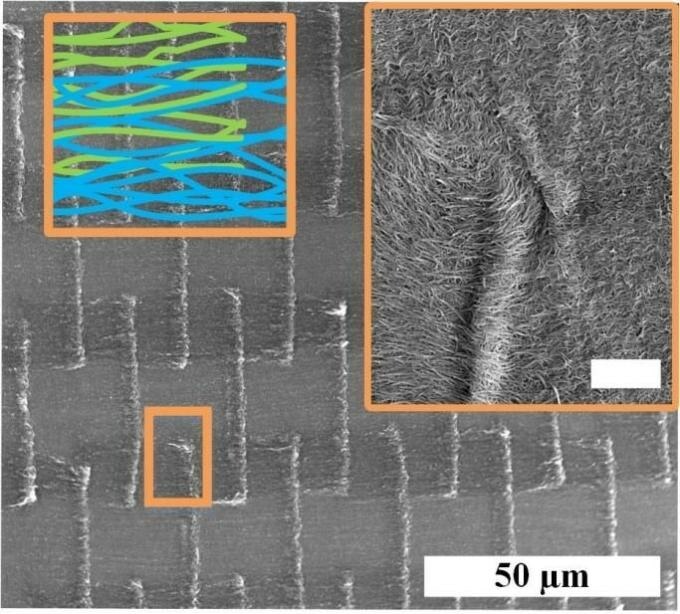 A team of researchers from the University of Illinois at Urbana-Champaign have synthesized thin carbon nanotube (CNT) textiles that display both high electrical conductivity and a level of toughness that is approximately fifty times higher than copper films, presently employed in electronics. They drew inspiration from the structure of composites found in the ancient world and nature. The structural robustness of thin metal films has significant importance for the reliable operation of smart skin and flexible electronics including biological and structural health monitoring sensors. Aligned carbon nanotube sheets are suitable for a wide range of application spanning the micro- to the macro-scales including Micro-Electro-Mechanical Systems (MEMS), supercapacitor electrodes, electrical cables, artificial muscles, and multi-functional composites. To our knowledge, this is the first study to apply the principles of fracture mechanics to design and study the toughness nano-architectured CNT textiles. The theoretical framework of fracture mechanics is shown to be very robust for a variety of linear and non-linear materials. CNT have been around since the beginning of the nineties, and have been addressed as a “wonder material” for a number of nanotechnology applications, and justly so. These miniature cylindrical structures created from wrapped graphene sheets possess a diameter of a few nanometers—approximately 1000 times thinner than a human hair, yet, a single carbon nanotube is stronger than carbon fibers and steel, lighter than aluminum, and more conductive than copper. However, it is quite difficult to construct materials, such as films or fabrics that exhibit these properties on meter or centimeter scales. The challenge rises from the difficulty of assembling and weaving CNTs since they are extremely small and their geometry is extremely hard to control. “The study of the fracture energy of CNT textiles led us to design these extremely tough films,” stated Yue Liang, a former graduate student with the Kinetic Materials Research group and lead author of the paper, “Tough Nano-Architectured Conductive Textile Made by Capillary Splicing of Carbon Nanotubes,” which appears in Advanced Engineering Materials. This is probably the first research on the fracture energy of CNT textiles. Starting with catalyst deposited on a silicon oxide substrate, vertically aligned carbon nanotubes were fabricated via chemical vapor deposition in the form of parallel lines of 10 μm length, 5 µm width, and 20–60 μm height. The staggered catalyst pattern is inspired by the brick and mortar design motif commonly seen in tough natural materials such as bone, nacre, the glass sea sponge, and bamboo. Looking for ways to staple the CNTs together, we were inspired by the splicing process developed by ancient Egyptians 5,000 years ago to make linen textiles. We tried several mechanical approaches including micro-rolling and simple mechanical compression to simultaneously re-orient the nanotubes, then, finally, we used the self-driven capillary forces to staple the CNTs together. Besides Liang and Tawfick, co-authors include David Sias and Ping Ju Chen.